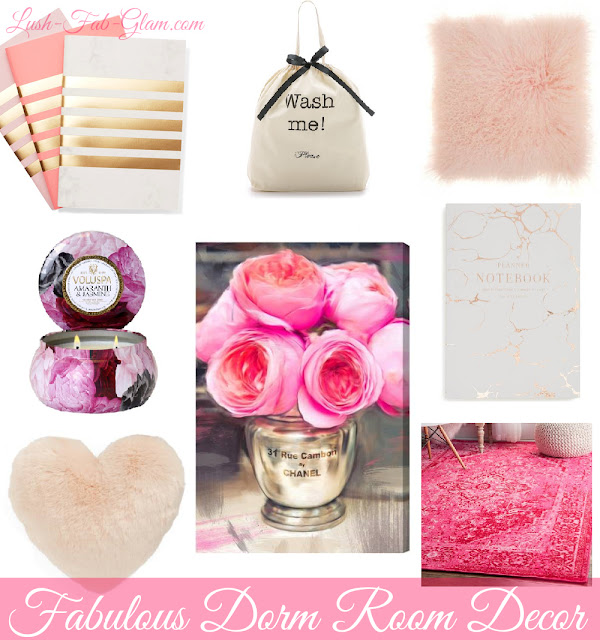 Fabulous Dorm Room Decor Tips & Essentials. In just a few short weeks the new school year and semester starts up for thousands of college and university students. For first year students especially the excitement and anxiety of living home and heading out on their own can be overwhelming. Especially when home will be a small shared dorm room or one bedroom space. Creating a space that is warm, inviting, relaxing and making it an environment that excites and motivates you to excel is extremely important. Since many universities have rules against painting or making certain changes to dorm rooms like hanging shelves etc. It's even more important to pick the right decor pieces that will easily and effortlessly transform your dorm room. From rugs, to temporary wall paper, art, lamps, bedding and more. Read on to see our tips and picks to help you design your dream dorm room that reflects your growth and this new chapter of your life in fabulous but affordable style. Plants, scented candles and throw pillows all help to create a home away from home atmosphere that you will love to unwind in after a long day of classes. Whether you apply them to the walls or use it to reface the standard draws of the night table and dresser in your dorm room. This easy peel and stick wall paper is a great alternative and less labor intensive than painting. Art is the perfect way to showcase your personality, choose to hang up paintings and photos of the things, people and/or places you love most, as long as it brings a smile to your face whenever you see it. Gloomy winter days are no help for young minds trying to stay, alert and focused while trying to meet paper deadlines are preparing for exams. Beautiful pops of color in your room dorm will definitely keep you in a more jovial and upbeat mood and a rug is a great way to add color especially when you can't paint your walls. Dorm rooms are usually narrow with only one window and no one wants to spend an entire semester or school year in a dark, dingy room. You can maximize the flow of natural light with mirrors that will help to reflect and spread it throughout the room. From your bedding, to your desk top lighting, laundry bags, notebooks/ planners etc, the details do matter, so choose essentials that inspire creativity. Get The Look: Click on the products features below to shop.